hello! a lurker finally decided to join! Favorite Conan Movie: I dont ..remember.. the latest movie i watched was 19,20 but i think earliest movies are lot better. definitely need to rewatch it soon. 1. Moonlight Sonata Murder Case --> i think the most memorable to me bcs the first time when the culprit decided to commit suicide and even conan/shinichi couldn't stop him (which once he remembered this case as one of his 'failure'). also seiji is my..favorite culprit..probably ? :"
3. Missing Man + ¥1,000,000,000 Robbery --> i think it was one of first brilliant Detective Conan's plot twists. 2. Secret Order from London --> ai is so cute. mitsuhiko too. 3. 16 Suspects --> what if every non-villain characters becoming a suspect in a case??? thankfully it's just wine robbery. 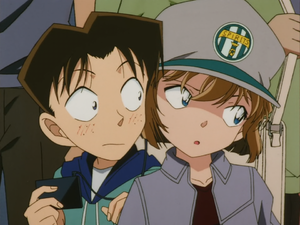 also bro before hoes of conan/shinichi / heiji is really....great. Re: hello! a lurker finally decided to join! If you've been reading the forums, maybe you know about Mafia? Definitely check it out. Thank you! oh you guys are playing mafia? xD i will check about it thanks for the info! !